Rhythmic Robot are so committed to preserving the ancient and the crotchety, I'm relying on them opening a nursing home one day. With everyone celebrating past analogue glory at the moment, SH Poly is a nod towards Roland's relatively rare duophonic synth, the SH7. It follows the well‑worn path of combining cleanly sampled recordings with a recognisable interface, plus a series of example patches highlighting what it can do. From a fairly modest synth engine, this turns out to be quite a lot. 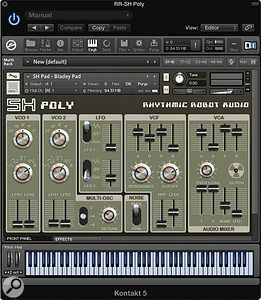 It's worth noting here that SH Poly requires the full version of Kontakt (v4.2.3 or later). So what do you get? Well, polyphony and an interface crying classic Roland for a start. The panel's knobs and sliders are dead ringers for those of the fabled SH5, SH7, System 100 and others. 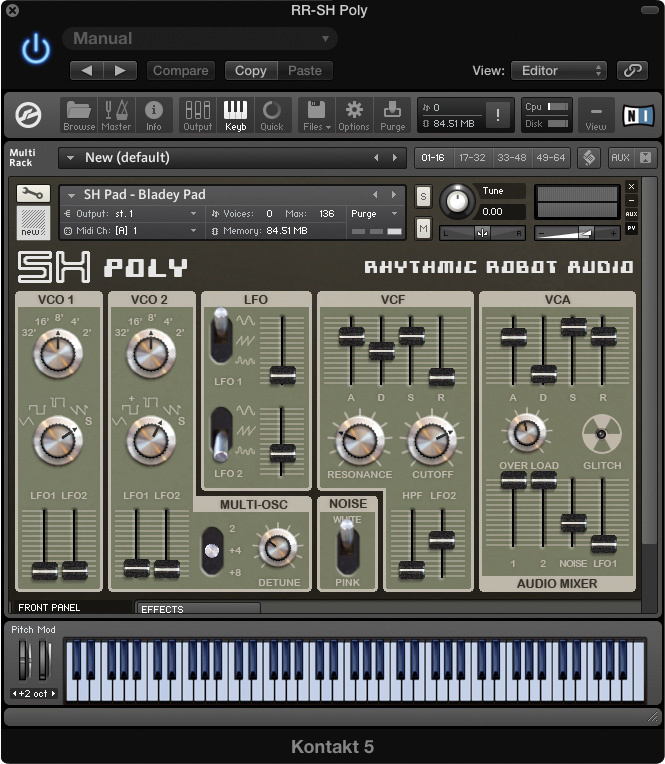 SH Poly may be built from Roland samples but the filter used is one of Kontakt's own, and though it doesn't immediately suggest the exotic and analogue East, it's serviceable enough. The two oscillators host a broad selection of waveforms, including triangle, square, pulse, saw and square+. The last of these is sampled from the SH7's five mixable square waves, although here it lacks any control over individual levels. Finally there's 'Synced Saw', the stolen essence of a synchronised VCO. It's a static sync waveform, but a useful extra flavour all the same. The oscillators can be detuned in the usual way or with a flip of a switch you awaken the Multi‑oscillator. This adds four or eight virtual oscillators, beefing up the proceedings considerably, especially in the swooshy strings department. Overload introduces a harder, overdriven tonality that I personally found more suited to single notes than chords. There are two envelopes and two LFOs. Unusually, one of the LFOs looks to be accessible from the audio mixer, but it's more of a graphical quirk really. Nevertheless, thanks to the wide range of LFO speeds, audio‑frequency modulation is a worthwhile ingredient for escaping plain vanilla synth tones. Similarly, a Glitch button scrambles the parameters and generates entirely new patches. It isn't wild, uncompromising randomisation either. Glitch's output is usually more musical than weird.